SOLD $257,500 AUCTION! Recently Renovated Historic 4 BR 3.5 BA All Brick Home w/ Antiques & Personal Property! 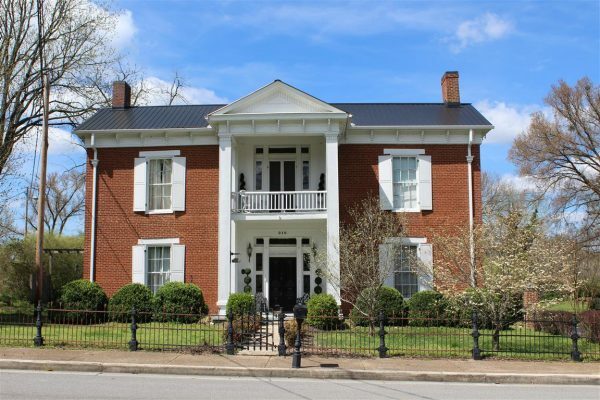 | Middle Tennessee Real Estate :: Maples Realty & Auction Co.
SOLD $257,500 AUCTION! Recently Renovated Historic 4 BR 3.5 BA All Brick Home w/ Antiques & Personal Property! This is a rare opportunity to own an amazing piece of history! This recently renovated historic 4 BR, 3.5 BA, all brick home has 4 porches, oversized 2 car detached garage with an unfinished loft. Home features a new roof, Corian countertops, stainless steel appliances, 9 fireplaces, large cellar, original hardwood floors and brick on most of the house. Perfect home for entertainment, large courtyard, pergola and fountain in the backyard. Conveniently located to all Cannon County has to offer, next door to the library, large lot that backs up to the park, 20 minutes from Murfreesboro. Great potential for Bed and Breakfast or venue. Personal Property includes: Furniture: plant stands, wooden file cabinet, chairs, wicker furniture, cast iron furniture, outdoor furniture. Antiques: lamps, Depression glass, Vaseline glassware, square grand piano from the 1920’s, 1800’s dress, furniture, baby carriage, old church bench, dolls, hats. Houseware: ice cream maker, food processor, bread maker, electric barbecue pit, rotisserie cooker, vacuum sealer, mason jars, cookware, cast-iron pots and pans, microwave, decorative glassware, crocks, milk jars, silver plated and sterling silver items, trunks, fireplace sets and equipment, quilts, paintings, clocks, carnival glass, candy dishes and serving platters, picture frames, cast iron pieces and fireplace fronts, candleholders, mirrors, Fitz & Floyd items, catering sets, china from occupied Japan, Royal Vista china, punch bowl sets, sterling silver punch bowl set, sterling silver lamp holders and candleholders, cast iron skillets and pans, Virginia rose china set, Noritake china, Nippon plates, figurines, vintage Heisey glassware, Jewel lite china. Tools & Yard: gas chainsaw, hand tools, chains, push mower, weed eaters, electric chainsaw, gas hedge trimmers, ladders, concrete planters, birdbath, yard art, bird houses, tool boxes, cast iron planters. Miscellaneous: fans, signage, vacuum cleaners, carpet cleaners, toys, books, Adirondack chairs, totem pole, fishing gear, ladies hats, Christmas decorations & trees, Halloween decorations, metal shelves, decorative wreaths, coolers, assorted luggage, old doors, windows and shutters, Pepsi machine, Pepsi wooden crates, metal fire pit, costume jewelry, and gas grill. Appliances: Front loading Whirlpool washer and dryer, deep freezer, stand up freezer and much more. Directions: From Murfreesboro, Hwy. 70/John Bragg Hwy. to right on College Street, property on right.